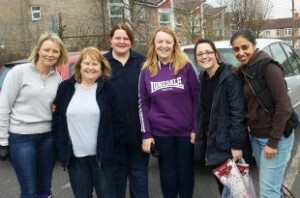 On 2 April 2014, 7 ladies from Jobcentreplus spent the day sprucing up our Dig and Discover Garden at Robert le Kyng and our Salt Way raised beds ready for spring planting. They met Julie, our garden guru, who showed them around and explained what needed doing. They then spent the morning digging over beds which had been covered for winter and weeding. Everyone worked hard to give the garden a spring makeover, and they collected a lot of compost material from their efforts. By 1 pm they sat down for a well earned lunch, then 4 ladies travelled over to Salt Way to sort out the 3 raised beds there. Some spring flowers were bravely forcing their way through the dandelions and the ladies soon dispatched brambles which had taken root over winter. In just a couple of hours, the beds looked fit for purpose again and they gave some strawberry plants room to produce delicious summer fruit. Thanks to Corinne and her team for their excellent work, let’s hope they didn’t suffer too many aches and pains the next day! We are now looking for regular volunteer gardeners to tackle the routine tasks at both sites to keep our gardens looking good throughout the summer. We would also like to offer some growing space to groups using our centres, so that they can grow their own crops. If your group is interested, please contact me, details below. Also watch out for our Tallest Sunflower competition, coming soon. Please contact me, Carol Harrison on 01793 465364 or carol.harrison@childrenssociety.org.uk if you can help.